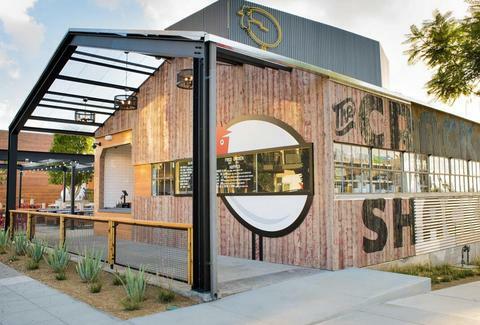 Hearing a “crack shack” just opened in your neighborhood might not sound like a good thing. But rest assured, if the team behind Juniper & Ivy is doing the opening, it most definitely is. It’s open early. Really early. If you’ve ever searched for something to eat super early in the morning, you’ve probably ended up in a drive-through line, waiting to hand over a few bucks for a paper bag of shame and future regret. Not here! Before 10:30am, the menu is a bit limited, but you can still score three different breakfast sandwiches, a power bowl, or chicken-fried farro as early as 7am. It’s much more laid back than its older sibling. Like, bocce ball laid back. In a lot of ways, The Crack Shack is many things Juniper & Ivy is not (fast, casual, and totally affordable); but the two locales also have some key things in common (like a solid bar program and unique decor). 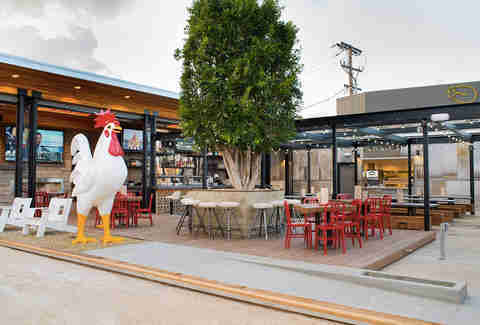 However, only one has all outdoor seating and a giant chicken looming over a bocce court. The menu is short and focused, but there are enough tempting options that it can be difficult to decide. If you find yourself debating the merits of a sandwich vs. fried chicken, the Señor Croque is a good way to go. 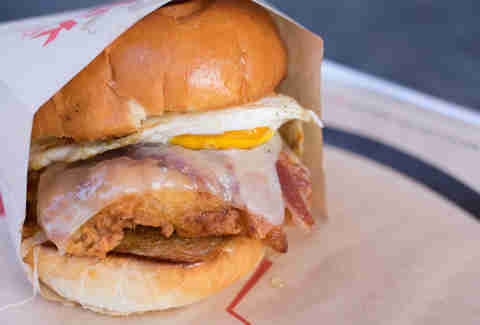 Between a squishy brioche bun, there’s a crispy chicken filet, a fried egg, bacon, a thin slice of melted white cheddar, and miso-maple butter (a sweet and savory spread that unites the pig and poultry in perfect harmony). Executive Chef Jon Sloan says he’s a fan because it “transcends breakfast, lunch, and dinner.” No wonder the place sells between 100 and 150 of this particular ‘wich every day. If you’re craving something with a more San Diego-specific flavor profile try a California Dip. The tasty torta and California burrito hybrid features pollo asado, schmaltz fries, and pickled jalapeño on bolillo bread sourced from a small family bakery in National City. It comes with a side of posole broth for dipping (or slurping, depending on your mood). The culinary team tinkered with different preparations, brines, salt levels, flour mixtures, and even debated different ways to cut the birds for four months before landing on the perfect recipe. 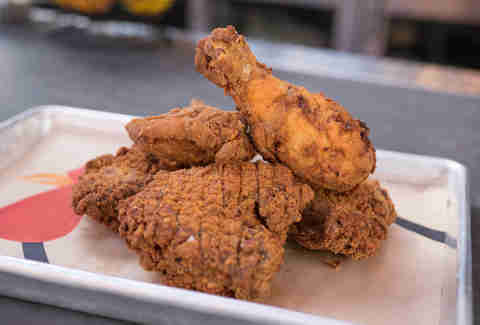 Their research also took them to LA, where they taste-tested 10 different fried chicken spots in LA (in a single day). In the end, they settled on a classic fried chicken recipe with a proprietary spice mix developed by Le Sanctuaire, a high-end spice merchant in San Francisco. Get it as a five- or 10-piece order and say yes to the biscuit basket. The same level of attention to detail that went into developing the core menu items was directed into The Crack Shack’s ambitious sauce program. This six pack of scratch-made sauces developed by Chef de Cuisine Bradley Austin gives you the power to tweak the flavor profile of your food with tangy, spicy, and creamy additions like kimchi bbq, chimichurri, curry mustard, baja hot sauce, buttermilk ranch, and “cracksup” -- house-made ketchup that contains the same unique spice blend that’s in the chicken breading. 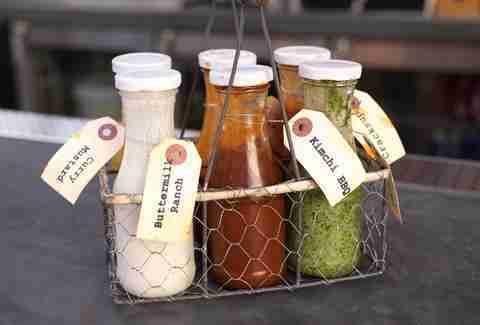 Best of all, unlike some places that unfairly make you commit to just one sauce, here you can try a little (or a lot) of all six. Before they hit your plate covered in pollo asado and jalapeño cheese whiz, the spuds at The Crack Shack have enjoyed a leisurely 24-hour soak in cold water, followed by a quick blanch in boiling water and a visit to the fryer (before they’re chilled in the freezer and fried for a second time... in rendered chicken fat -- aka schmaltz). 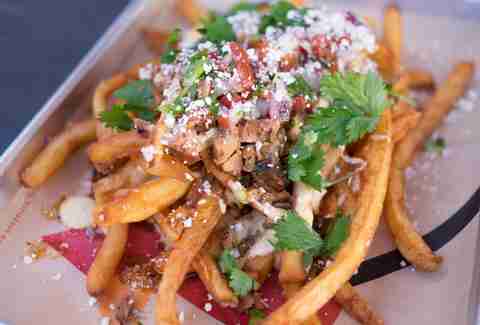 If you don’t want to commit to the “Mexican Poutine” presentation, you can score a full pound of fries for a mere $5. Do it. Not feeling fried chicken? No problem. 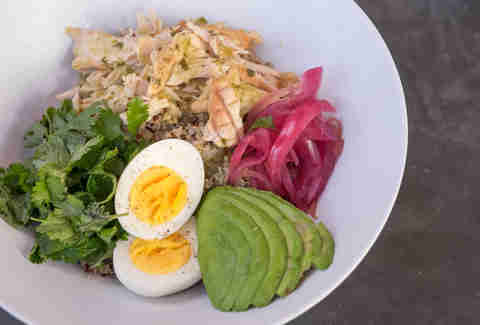 The menu has a variety of low-carb, high-protein options like this Anti-Salad Power Bowl with a soft-boiled egg, sliced avocados, smoked chicken, pickled onions, and heritage grains bathed in tomatillo salsa. Other healthy options include border slaw (tropical fruit topped with chile and lime) and a rogue sandwich dubbed Chicken of the Sea (wood-fired albacore with passion fruit aioli served on a sprouted grain brioche bun developed specifically for The Shack by the carb kings at Bread and Cie). Acclaimed bartender Eric Johnson (who is also responsible for creating the standout cocktails at Juniper & Ivy) assembled a quality cocktail list with a variety of reasonably priced drinks suitable for sipping outdoors from early morning to late in the afternoon -- including a Bloody Mary spiked with green chile vodka and house-made hot sauce and refreshing, fruit-leaning options like the Play Date (with apple brandy, almond, pomegranate, lime, and grapefruit). 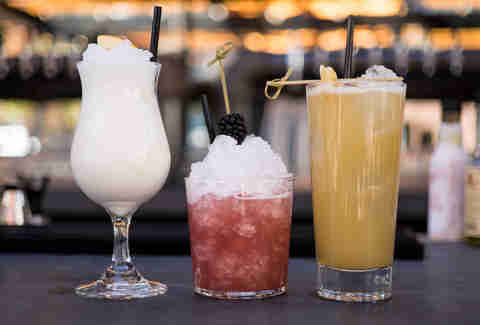 Want something non-alcoholic? You’ll find fountain drinks from Stubborn Soda, plus a variety of coffee and tea options. It might appear like standard-issue soft serve, but that’s smoked vanilla and chocolate mole soft serve you’re eyeballing. 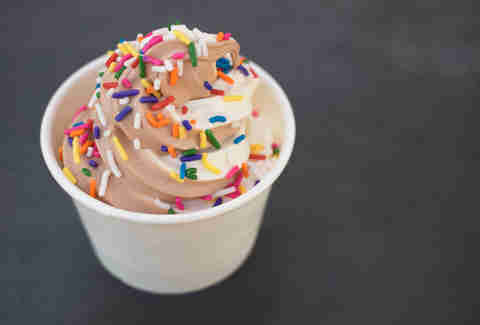 The chocolate half of the swirl is made by steeping charred tortillas, chiles, chipotles, and sesame seeds in the ice cream base (before it’s strained and frozen). Other tempting desserts include a rotating “cookie du jour.” If you see the cookies and cream cookie during your visit, definitely snap one up because the best cookies are cookies made from other cookies. Sloan says an off-menu ice cream and cookie sandwich (aka a “flying saucer”) is in the works, so keep your ears tuned for sightings.